Symbols bring a high degree of noticeability to a sign or label’s design; they catch the viewer’s eye when text-based information would have otherwise been overlooked. Symbols are efficient. Truly, once learned, an image is worth a thousand words. This is because the human brain can visually process the meaning of a learned symbol in a fraction of the time it takes to read and understand a word message. In fact, entirely different portions of the brain are used to process images and words. When well-designed graphical symbols are used, you have a better possibility of communicating your safety messages across language barriers. This is incredibly important in today’s global marketplace where people travel and products are sold worldwide. It’s also becoming more important in the U.S. where ethnic diversity is increasing. “Visual literacy” is on the rise. And the desire to read text-based information is on the decline. Websites, especially most mobile sites and social media sites, are visual in nature – designed to ‘scan’ rather than read thoroughly. Images are given priority over words. To take advantage of these benefits, your company’s safety signs and labels should incorporate graphical symbols to convey a portion (or all) of their message in visual form. When your sign or label needs a customized symbol, know that you will never be “reinventing the wheel” when you use Clarion’s services. Our standard and customized symbols are created using the latest best practice U.S. and international standards-based design rules. We know these rules well as we helped to write them. 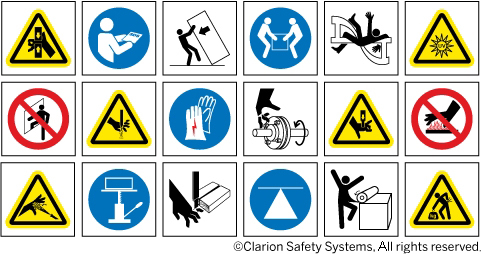 The net result of all of the customization we’ve done over the years is that we have the largest library of safety-related graphical symbols in the world. There’s a science to creating icons that communicate. Our leadership participation on the standards committees responsible for symbols helps to inform the process we use for every customer who requires our custom symbol design services. Use of the standardized symbol design rules is meant to yield consistency, a characteristic which is highly important when it comes to making icons that can be visually learned and understood. 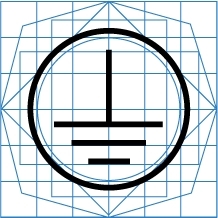 For example, the ISO and IEC committees in charge of equipment function/control symbols developed a carefully constructed grid template to use to draw symbols. Symbols created on this template will share specific line widths and spacing, giving them the same visual weight. This quality then helps these symbols to be uniform, a quality that’s necessary when symbols are used in groups, such as on control panels. The standardized design rules also help viewers to see the symbols, since the guidelines are written with legibility in mind. The symbols we create for our customers take into account many factors, factors that define the “best” in “best practices.” Our Design Department is unique – we begin and end safety symbol design with an understanding that the design of the safety symbol, as well as the design of the entire sign or label, must embody principles defined by the standards. Each part of the sign or label’s design must work with its other components. Size, shape, color, white space, symbols and text all combine to achieve the goal of clear, precise communication. We specialize in partnering on fast, easy and precise customization – for safety signs and labels that meet your needs and today’s best practices. 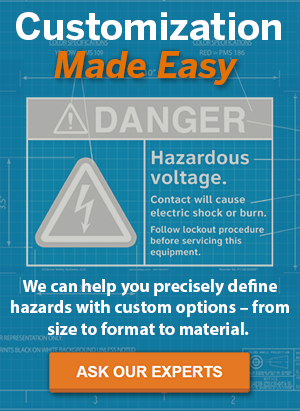 Our customization specialists are ready to work together to develop your custom warnings. To get started, use our online custom quote request tool. You can also contact us at (877) 748-0244 or compliance@clarionsafety.com.